Sustainable development and environmental protection are concepts that are often confused. 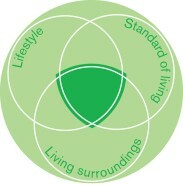 While the environment – our living surroundings – is the basis for sustainable development, the latter also refers to two equally important issues: society (our lifestyle) and the economy (our standard of living). Together, the environment, the economy, and society contribute to quality of life in our community. To be considered sustainable, actions must be judged on their impact on the environment, the economy and society. The quality of our living surroundings depends on environmental responsibility, including recycling and re-using materials, reducing energy consumption and limiting our environmental footprint, cutting carbon emissions, and other initiatives. Lifestyle encompasses the social impact of business practices, including knowledge transfer, work-life balance, values and priorities, and respect and protection of our cultural heritage. Standard of living refers to the economic impact of our activities, including job creation, strategies to stimulate local economies, economic growth, and profitability. Sustainable development is a priority at Florence. Contrary to companies that cloak themselves in a “green blanket” or masquerade as environmentally responsible, Florence provides services that enable local businesses and organizations to honour their commitmen t to sustainable development or take a first step in the right direction. In addition, our ISO 14001 certification in environmental impact management is a tangible expression of our commitment and a source of pride.